How long will customers wait in call centre queues? How long will a customer wait in your call centre queue? What is the cost of abandoned calls and how can the damage be minimised? The question of how long a customer is willing to wait has been discussed much. The conclusion drawn by many, including Jonty Pearce, editor at Call Centre helper, is that it depends on the service for which the customer is calling. 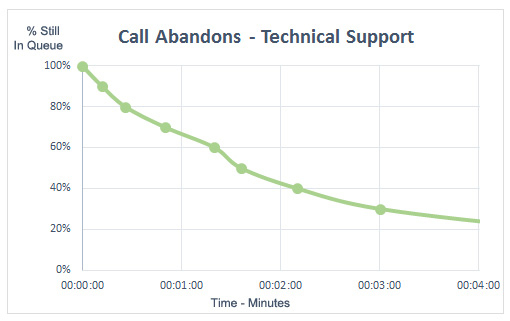 The stated examples from the graphs below, taken from a study in Call Centre Helper, below show that people ring off far quicker 60% in the first minute for sales lines than technical support ones. However, even with support lines over 35% of people rang off within the 1st minute. For sales lines the cost is obvious and huge. 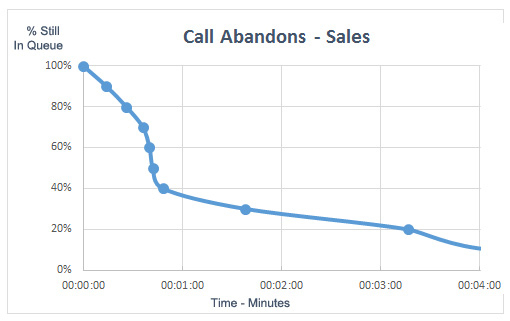 If you have a call queue that is averaging greater than a minute you are potentially losing at least half your revenue opportunity. You are relying on the prospect calling back, and in today’s competitive cut and thrust you usually only get one chance. For support lines, the cost is less obvious and more long term. It’s our believe that your customers aren’t stolen by the competition, they walk! Poor levels of customer service in a contact centre loses customers, and reduces rates of acquisition through poor reputation and word of mouth. People over the years have suggested any number of quick fixes like increasing agent capacity, changing welcome messages to stop people from hanging up, increasing the initial ring time, or altering the frequency of queue messages. All of these are either uneconomic or just making well-meaning but negligible adjustments with the problem. The idea of giving a caller the option of an agent call back was introduced around 15 years ago and has been adopted by some, but has been beset with a number of issues. The challenge has always been that it places more strain on busy agents and you can end up wasting more resource playing telephone tag if the caller isn’t available when you call back. When the customer misses the agent call back, what do they do then? Do they have to call back into the queue and start again? What’s more if your agents aren’t able to call back when you promised, it just raises the customer dissatisfaction levels higher. The issue with agent call back is that the whether the customer is in your queue or waiting for you to call back, they aren’t in control, as far as they are concerned they are still waiting. So one option is to turn this around, give the customer control of the queue. Still save their place in the queue, as with agent call back, but enable the customer to call back at the time of their choosing when they are at the front of the queue. OrderlyQ does just this, it not only improves satisfaction rates with customers and increases sales revenue on sales lines, it hands back control to the customer without increasing the resource levels at the call centre. Call centres such as at Benson Beds adopted customer call back several years ago and have seen their answer rate increase by over 40%; with answer rates consistently in excess of 98%. This has helped restore the company’s reputation and revenue growth.